How Do You Plant Sedum Roots? There are advantages to planting bare-root sedum over sedums in containers, according to the National Gardening Association. The roots are healthier and establish themselves much sooner than the container plants.The cost is usually less as well. Plant your bare-roots within two days of receiving them. They are ready to go in the ground as soon as the soil can be turned over and isn't too wet. If you're not able to plant directly into the ground, plant your bare-root sedum in a plastic pot for later transplanting. Sedums can be ground-covers or tall types (under the botanical name Hylotelephium), and are hardy in USDA Plant Hardiness Zones 3 to 9. Check the condition of bare-root sedums as soon as you receive them. The roots should be a light beige color and firm to the touch. The packing material is usually wood shavings or peat moss, and should not be too wet. Don't be alarmed if you notice some mold on the roots. If the roots are soggy and black, contact the nursery from where you purchased them. Shake off the packing material from the roots. 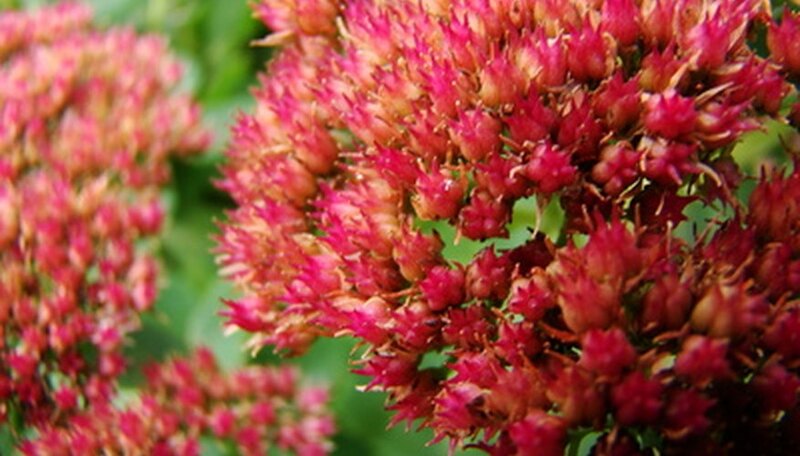 Trim off any long roots or rotted areas of your sedum. Place the roots in the pail of water. Choose a location in the full sun for planting your sedum. Turn over the soil and add sand if the existing soil requires drainage. Dig a hole eight to 10 inches deep and about eight inches wide. Add the planting mix into the hole, mix with the existing soil and water thoroughly. The National Gardening Association recommends forming a cone out of the soil in the hole. If you are planting more than one bare-root sedum, give adequate space for each one. Tall sedums require approximately 18 inches between plants and ground cover sedums should be about a foot apart. Take the plant out of the water. Spread out the roots and place them over the cone of soil in the hole. Backfill with soil, adjusting the sedum so that the crown is just below the soil surface, The crown is just above the roots and below where the stems will form. Sometimes small sedum rosettes are present. Water the plant thoroughly. Water every other day for the first week, then once a week for the first season. Follow Steps 1 and 2 in Section 1. Fill the plastic pot half-way with the potting soil. Press the soil down but do not compact it. Water the soil lightly. Spread out the roots of the plant and backfill with soil. The soil should be at a level just above the crown without covering the top of the sedum. Water the plant thoroughly. Let the plant root into the soil for several weeks before planting it in the ground. Take the plant out of the pot by gently tapping on the bottom. Follow planting instructions beginning with Step 3 in Section 1. Sedum are easy to grow and don't require much additional water once they're established. Tall sedum types may be pruned in early summer to make plants more compact. Sedums have no serious problems. Do not plant your bare-root sedums too deep as the crowns will rot. Too much fertilizer will cause your sedums to flop. Missouri Botanical Garden: Hylotelephium (Herbstfreude) "Autumn Joy"
GPN: Sedum x hybrid "Black Jack"